Learn to make Lapsi Recipe | Sweet Dalia | Cracked Wheat Dessert Recipe with a simple recipe video tutorial. Lapsi is a traditional cracked/broken wheat dessert, which is a moist and soft pudding oozing with the richness of the clarified butter/ghee. 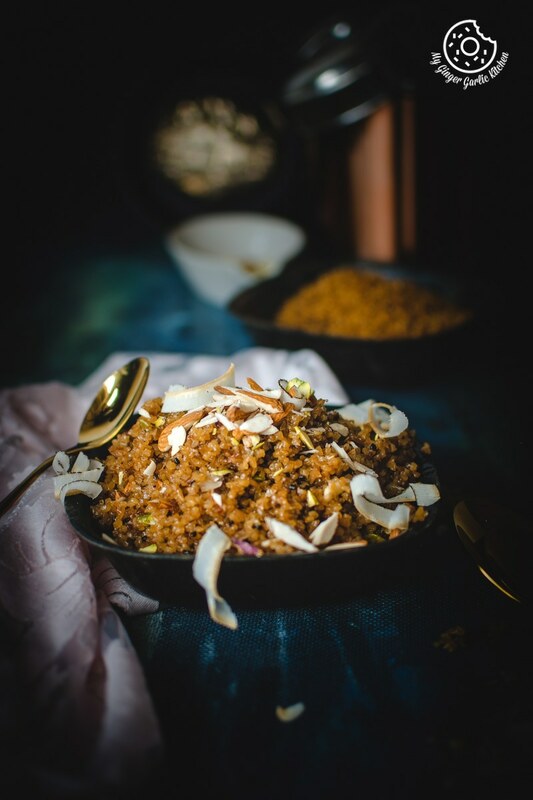 This wonderful Indian sweet Lapsi is super easy to make, and it is ready in minutes. Plus, no fancy preparation or baking/cooking skills required for making this. 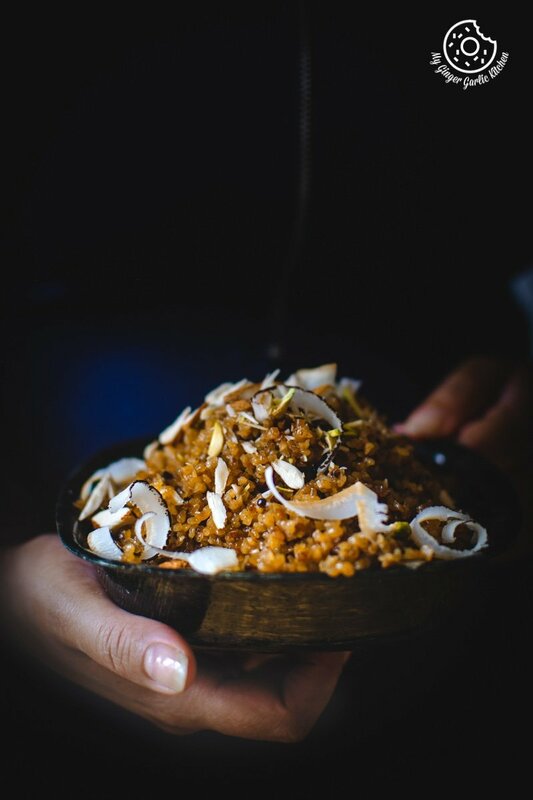 Lapsi has all the healthy goodness of ghee (which is an ultimate superfood), cracked wheat, jaggery/sugar, dry fruits, and cardamom powder. The tempting flavors of this toothsome dessert will surely make you and your loved ones drool. Lapsi is usually made as an offering to Indian Gods on some auspicious occasions, and for puja (a prayer ritual performed by Hindus towards devotional worship to deities). What is the origin of Lapsi? 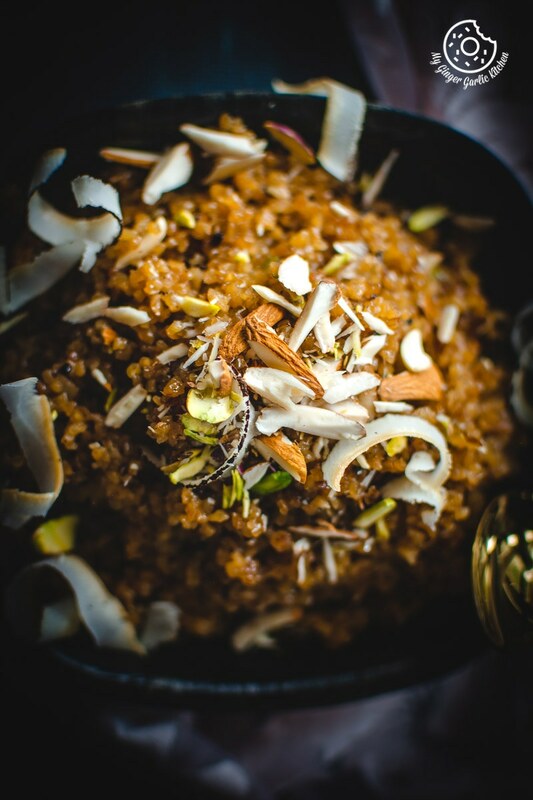 This dessert Lapsi hails from the western Indian states of Rajasthan, Gujarat, and Maharashtra. This is a pudding made with Dalia which also known as broken (cracked) wheat. Lapsi is an easy to make, quick, simple, and earthy dessert. You don’t need any fancy ingredients or utensils for making this humble dessert. 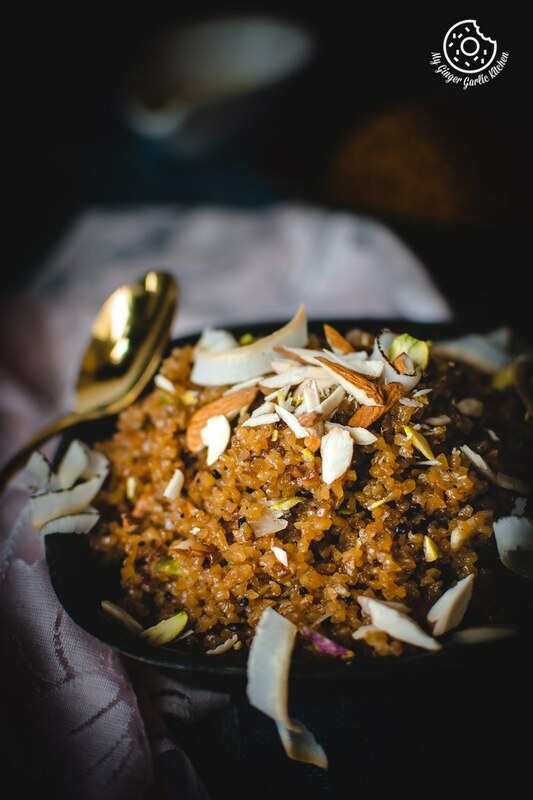 In this dessert broken wheat aka Dalia is roasted with ghee until golden in color. 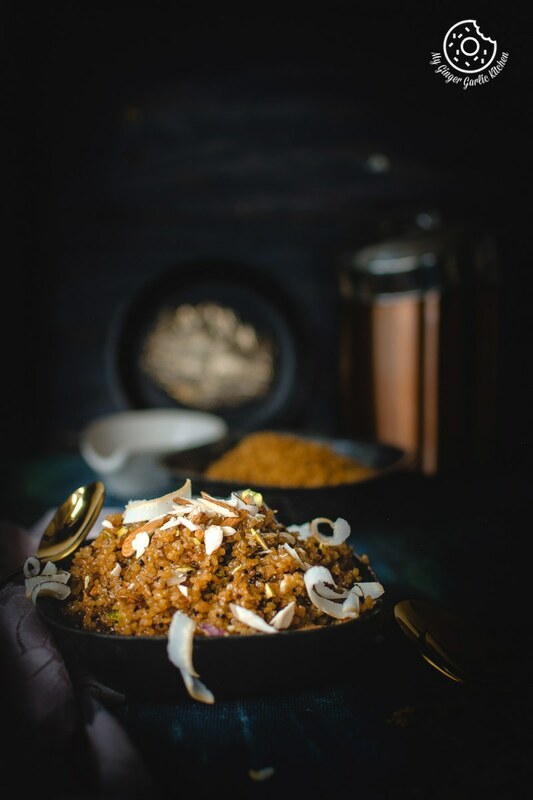 Roasting the cracked wheat in ghee gives this Lapsi a rich and classic brown color, intense aroma, and a delicate flavor. After roasting it is cooked/boiled in water until soft. Later this is sweetened with some sugar/jaggery. And finally, it is flavored with some coconut shavings and cardamom. This is one of such timeless recipes which is adored by people of all age groups. My great-grandfather loved it and now my daughter also loves it. What are the other names of lapsi? 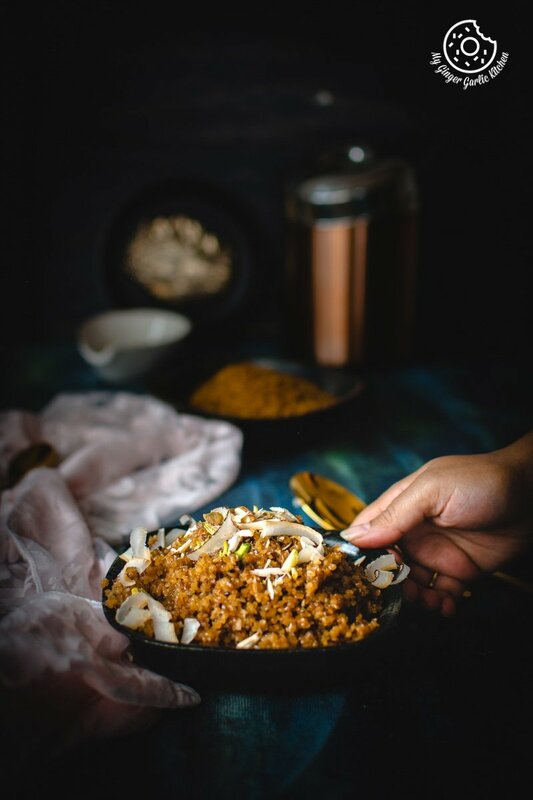 Lapsi or Laapsi has other names such as Lapsi Hawla, Fada ni Lapsi, Meetha Dalia / Sweet Dalia, Lapsi Sheera, and Broken Wheat Dessert, or Cracked Wheat Dessert/Halwa, and Cracked Wheat Pudding. What is Lapsi made of? Lapsi, a very delicious pudding made using broken wheat which is generally made on auspicious occasions and festivals in the Indian states of Gujarat, Rajasthan and Maharashtra. Gur ki Lapsi is a dessert dish made from Dalia, aka broken wheat. This is an old-fashioned version of making lapsi. 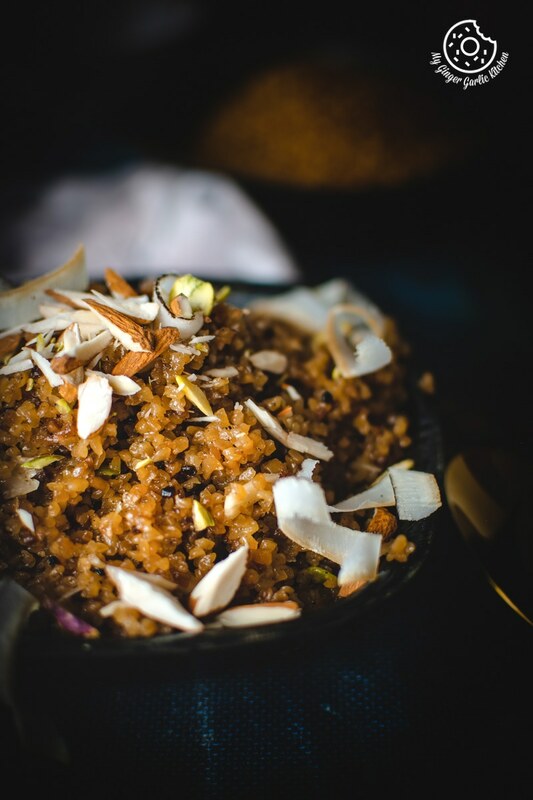 In this dessert, jaggery aka gur is added instead of sugar. This is healthier than the sugar version of lapsi. Broken wheat or dalia is a good source of vitamins and minerals, which makes it nutritious. Lapsi is made with dalia, thus, Lapsi can be a good nutritious meal for the kids. Since lapsi is loaded with fibers, proteins, and iron, therefore its great for growing kids. Addition of chopped nuts to this dessert dish makes it a lot more richer, tastier, and desirable. However, you need to consider few important points when you are making it for babies or toddlers. Try to avoid any kind of sweetener, but if you have to add then opt for little jaggery. There are generally 3 types of broken wheat dalia available in the market. Large grain, medium grain and small grain. Always use small grain for making lapsi for kids. 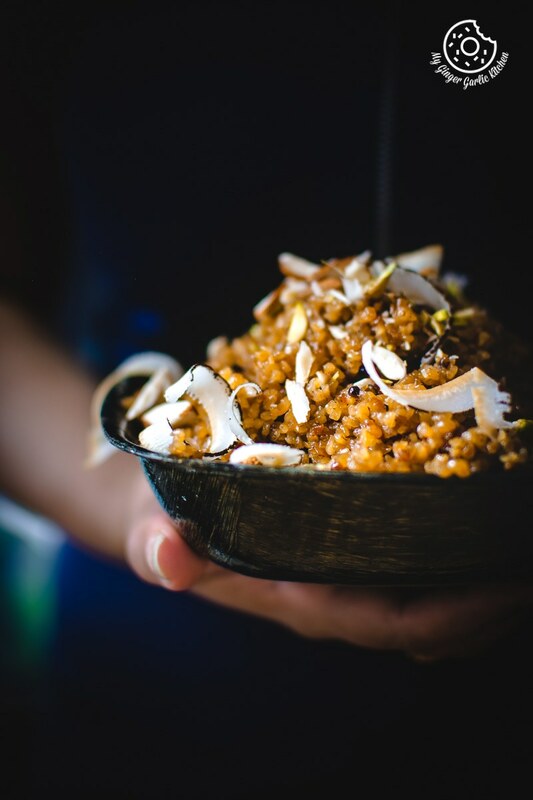 You can also choose bulgar wheat which is usually parboiled. Also, try to cook lapsi in milk instead of water to get that rich, more nutritious porridge-like consistency. This way it is light on child’s stomach, and easier to digest. Blend it into a puree if you are serving it to babies. How do you cook Lapsi? How is Lapsi made? Cooking lapsi is very simple and easy. You just need to roast dalia aka broken wheat with desi ghee and then boil it until soft and moist. This laapsi recipe is passed to me by my Granny. My Granny used to cook it in a deep pan on the stove. Then she used to add the sweetener such as jaggery or sugar. This stovetop cooking process takes some time. Unlike my granny, my mom cooks it in a pressure cooker, it reduces the cooking time. No matter how you cook lapsi, it will always turn out delicious. 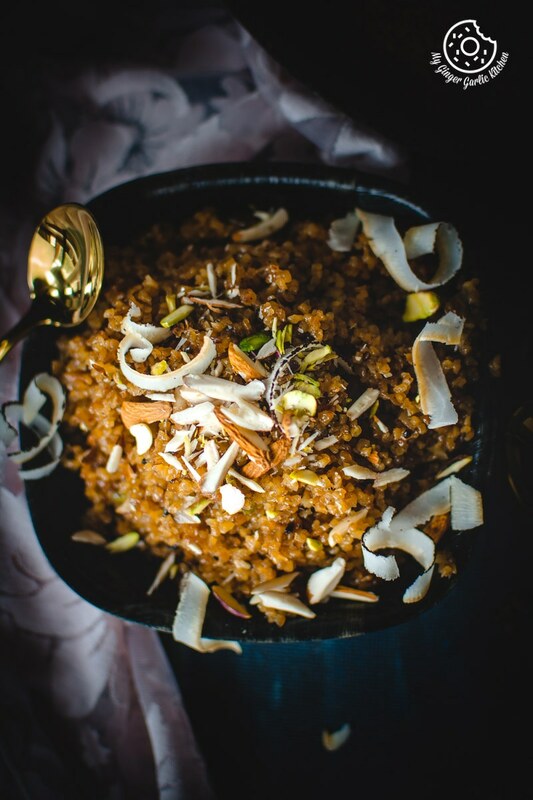 If you are pressed on time and still want to cook some quick, healthy and delicious dessert, then you can easily cook this wonderful lapsi in a pressure cooker. This will be ready in no time. How to make Lapsi Halwa? 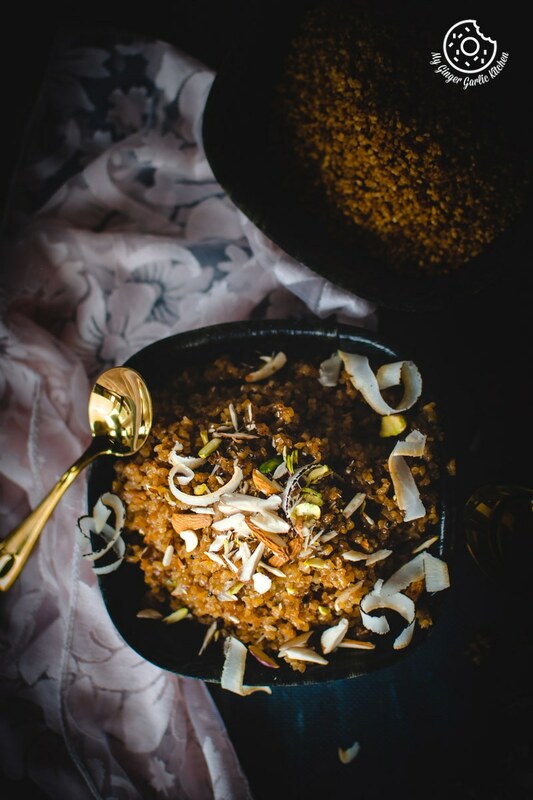 Lapsi halwa is a healthy halwa made with Dalia and jaggery. This is cooked by roasting the broken wheat in ghee. Roasting the broken wheat in ghee gives this Lapsi a rich brown color, extraordinary aroma and a delightful flavour. The traditional Rajasthani way of serving this lapsi is to pair it with some piping hot spicy kadhi, steamed rice, and puri or chapati. This combination is known as Lapsi Kadhi Chawal. Eating Kadhi Chawal with Lapsi was a must at my home. You can also serve this as an after meal dessert to your family or guests. Like Dal Bati Churma, Lapsi Kadhi Chawal is a very popular meal combination of Rajasthani cuisine. What is meant by broken wheat? Broken wheat is a name for whole raw wheat grains which are cleaned and then processed coarsely. Broken wheat is also known as Cracked wheat which is made of whole wheat grain. This grain is usually known as Dalia Hindi. Samba rava, godhuma rava are few other names of broken wheat. Broken wheat also is known as bulgur or bulghur wheat in the Middle East. It also has similar health benefits as quinoa. Yes, cracked Wheat is definitely healthy. Whole grains like cracked wheat Broken wheat/dalia provide fibers, protein, vitamin B6, iron, and antioxidants. Is cracked wheat the same as whole wheat? No, they are not. Whole wheat always has a whole grain, whereas cracked wheat is crushed and has small amounts of the bran. Lapsi Rajasthani recipe: Rajasthani Lapsi is an enticing and palatial dessert of Rajasthani cuisine. This pudding is so full of the healthy goodness of broken wheat. It oozes with ghee and has a good amount of dry fruits which adds a nice luxurious texture to this dessert. Then there is a final touch of cardamom. The aroma of ghee roasted Dalia with cardamom is something to live for. How to cook Rajasthani lapsi? Rajasthani Lapsi is cooked the same way as Gujarati or Maharashtrian Lapsi. Is Lapsi and Dalia the same? No. Lapsi is a dessert, and Dalia is a grain. Dalia is a Hindi name for broken or cracked wheat. And lapsi is a dessert made using dalia. 1. Heat 4 tbsp ghee in a pressure cooker. 2. Add 1/2 cup broken wheat and sauté on medium heat for 5 minutes or till golden. 3. Boil 2.5 cups of water in a pan, and add this to the pressure cooker. 4. Stir well and close the lid. Pressure cook for 4 whistles. 5. Turn off the heat, and let the pressure go down completely. 6. Stir well and let the water vaporize. Add sugar/jaggery and mix well. 7. Cook for 5 minutes or till the sugar melts completely and juice evaporates. 8. Add 2 tbsp of ghee and stir well and cook for a minute. 10. Now add coconut shavings, chopped nuts, and mix well again. 11. Cook for 1 more minute, and turn off the heat. 12. Drizzle with some ghee, garnish with chopped nuts and serve hot. 1. Take a thick deep bottomed pan. 2. Add 4 tbsp ghee in it and heat over medium heat. 3. Once the ghee is heated, add in the broken wheat and stir the mixture until golden brown in color. 4. Now boil 2.5 cups of water in a pan, and add this to the pan and let the broken wheat cook until it gets tender and the water is almost evaporated. 5. Once the mixture is vaporized, add the jaggery/sugar. 6. Cook the mixture on medium-low heat for about 5 minutes till the sugar melts completely and juice evaporates. 7. Add 2 tbsp of ghee and stir well and cook for a minute. 8. Add cardamom powder and mix well. Once done remove the lapsi from heat. 9. Drizzle with some ghee, garnish with chopped nuts before serving and serve hot. 1. I have added only 1/4 cup of sugar here, but you can surely increase the amount. 2. You can replace coconut shavings with grated or desiccated coconut.